Correos has renewed its fleet, purchasing 404 Renault Kangoo vans for €4.9 m. The vans have a capacity of 750 kg payload each, and they will be in use in all provinces of Spain starting December 1, 2018. 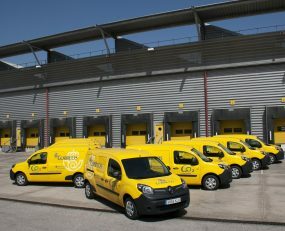 Renault offered Correos technical benefits alongside the vans. Renault has included in the basic-price of the vehicles a series of free additional services such as transportation, delivery, registration, warranty, training, documentation and maintenance of the vehicles during the warranty period. Renault ensures that its manufacturing processes comply with the Euro6 standards. The vans will be labelled with the official logo of Correos, and the driver’s area will be separated from the cargo area by a fixed sheet metal. Of the total of 404 units, 59 vans will go to Barcelona, 45 to Madrid, 39 to Valencia, 32 to La Coruña, 30 to Seville and the rest will be distributed to the other provinces in Spain.